In addition to the teddies, I write for Teddy Bear Scene and the other teddy bear magazines, produce web sites, and look after my mum so I don't get much free time. When I do I mould things out of clay or cold porcelain. These are mainly bears, dragons, fruit and other things taken from nature or fantasy or even the claws and teeth used in some of my fuller featured bears and cats; although I have also started making people like wizards and American Native Indians. Some of these become ornaments while others become jewelry or friends for my teddies and the smaller items are sometimes used as accessories for their hats and clothing. I am totally cat/animal mad so I try to support animal charities and do what I can for the many birds, squirrels and hedgehogs etc that visit my garden. I love nature and the challenge of creating things (whether 3d objects like bears and dragons or less tangible objects like applications and web sites) so any free time I have is spent either creating something (this includes writing, painting, web sites and programming). I also enjoy walking, flying (alas just model planes) and photography. 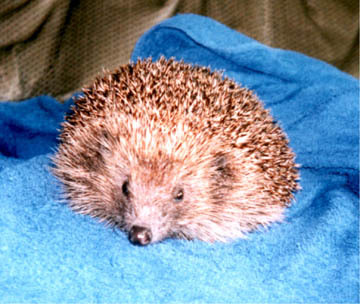 The little chap in the picture is one of a family of 5 hedgehogs that spent last winter in my dining room. It was taken roughly mid winter. All five turned up one after the other late November, too small to survive the cold, the smallest being under 250 grams. After a visit to the vet to make sure they were all OK they lived in a cardboard city I created for them and grew nice and fat on cat food, ground peanuts, vitamins and meal worms, so by the summer they were all over 1 kilo in weight. They now live in an area of Leicester that has been made into a local animal sanctuary where they roam free with lots of other animals including other hedgehogs.